Denver's favorite summer lunch tradition returns! Delicious food, fresh air, gorgeous views, live music and a great cause... 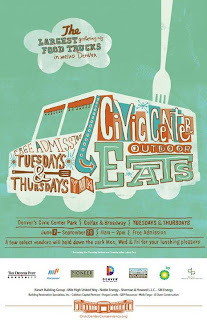 The seventh-annual Civic Center EATS Outdoor Café takes place in Denver's Civic Center Park (Colfax & Broadway) on Tuesdays AND Thursdays - from 11 a.m. to 2 p.m. - June through September 2012 (excluding 7/3, 8/30, 9/4 and 9/20 due to other events taking place in Civic Center). As part of Downtown Denver's Make Music Denver Day, a Colorado Symphony Brass Ensemble will play at Civic Center EATS on Thursday, June 21st. An incredible venue in which to experience Denver's growing gourmet food truck scene, a portion of the proceeds benefit the Civic Center Conservancy, the nonprofit dedicated to restoring, enhancing and activating Denver’s historic Civic Center Park. 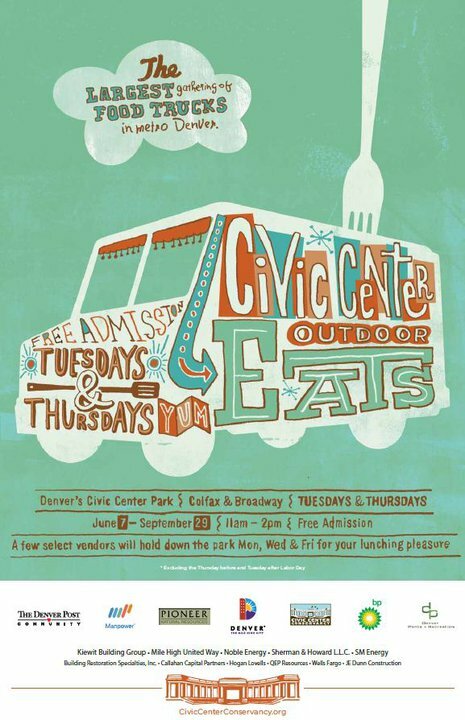 Civic Center EATS provides an opportunity for downtown employees, residents, and visitors to experience the beauty of Civic Center, enjoy a delicious outdoor lunch, listen to live music and connect with the community. Shaded tables and an on-site ATM are provided. Civic Center EATS is presented by the Civic Center Conservancy and produced by Hobnob Events with support from our generous community sponsors: The Denver Post Community, BP America, Denver Community Credit Union, Pioneer Natural Resources, Denver Parks and Recreation, Kiewit Building Group, Noble Energy, Sherman & Howard, SM Energy Company, Building Restoration Specialties, Inc., Hogan Lovells, QEP Resources, Inc., Wells Fargo, JE Dunn Construction and Callahan Capital Partners.